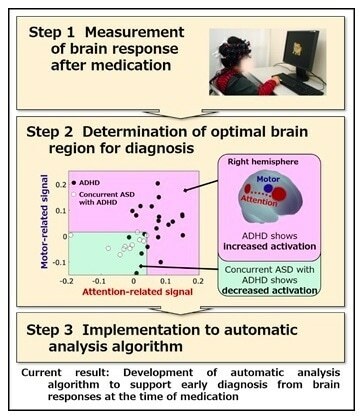 Hitachi, Ltd., Jichi Medical University (JMU), International University of Health and Welfare (IUHW) and Chuo University (Chuo-U) have developed fundamental technology to support the early differential diagnosis of concurrent autism spectrum disorder (ASD) in patients with attention-deficit hyperactivity disorder (ADHD). The technology automatically analyzes the presence or absence of concurrent ASD when an ADHD patient takes their medication for the first time, by using optical topography to measure brain response. The condition can be predicted with a confirmed accuracy of about 82%. Conventionally, differential diagnosis requires follow-up observations spanning several months. This technique demonstrates the possibility of achieving a diagnosis in about 2 hours. Hitachi, JMU, IUHW and Chuo-U will continue to develop this technology through clinical research, with the aim of realizing a society that supports the healthy development of patients with neurodevelopmental disorders. Long term ADHD and ASD in children are thought to lead to refusal to attend school, hikikomori (reclusion from society), depression and other conditions. Differential diagnosis to reveal the presence or absence of symptoms for both illnesses is necessary, as it has been reported that the numbers of patients displaying characteristics of both ADHD and ASD are not small. Further, as determining treatment methods and therapy is a time-consuming process that increases the burden on patients and their families, reducing the time to accurate diagnosis was desired. In March 2018, research led by JMU discovered that it was possible to visualize the presence or not of concurrent ASD by measuring the brain activity patterns of ADHD patients who have no prior history of taking related medication, before and after taking the medication. Based on this finding, an algorithm was developed to automatically analyze whether or not the ADHD patient is concurrently afflicted with ASD. Dr. Shinya Miyamoto, Professor at Shirayuri University and Chairman of Japanese Society of Pediatric Psychiatry and Neurology. Dr. Shigeto Yamawaki, Specially-Appointed Professor of the Center of Brain, Mind and Kansei Sciences Research Center, Hiroshima University, and the former President of the International College of Neuropsychopharmacology.